Gaylord boxes may not be recognized by their title, but they are essentially pallet-sized boxes used to transport bulk goods. This term derives from the trade name of a bulk corrugated box maker, Gaylord Container Company of St. Louis. 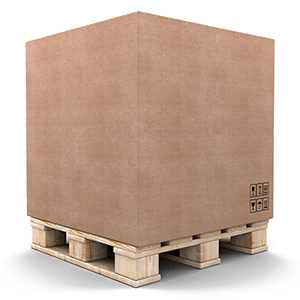 Originally only referring to jumbo sized boxes, the label has broadened to include any pallet-sized box. Perforated, partial or removable walls for ease of loading and unloading or display purposes. A separate base and a side wall sleeve to assist in loading and unloading. Additional liners and reinforcements to combat bulging. Direct Supply meets your bulk pallet container needs. Providing a variety of pallet containers to protect and transport your goods, we offer quality solutions to you. Whether you seek new or used Gaylord boxes for sale, contact us today. We are eager to talk with you and find the bulk bin which best addresses your product storage and shipping specifications. After all, customer service remains a priority at Direct Supply!